Arriving at Les Sources de Caudalie is a little like entering Wonderland, where nothing is quite as it seems and everything leaves you grinning like a Cheshire Cat. This family-owned hotel and spa, just 20 minutes’ drive from Bordeaux, is set in peaceful vineyards, where the only sound you hear as you walk around the hotel’s own lake is birdsong, and swans adorn the still waters. A sculpture of a giant leaping hare greets you outside the hotel, and when we visited in late November the Christmas decorations had just been put up – as well as fairy lights and a large topiary deer and bear by the front door; a colony of topiary rabbits graced the table in the hallway. Later in our stay, I clocked the silhouette of a large rabbit who had run through a hedge; either the gardener had a sense of humour or this lagomorph – who was probably white and sporting a timepiece – was late, late for a very important date. If so, he was the only one rushing. At first glance, this beautiful hotel with a number of outbuildings appears to be a part of a centuries-old chateau, but was in fact opened in 1999, created from recycled local materials and designed to blend in with Château Smith Haut Lafitte, a few hundred yards away and home to Florence and Daniel Cathiard. Their youngest daughter Alice (of course, we are in Wonderland after all) Tourbier helped to design the 40 rooms and nine suites, all individually styled and oozing timeless French chic. My enormous room overlooked the vineyards and, as it was late autumn, had a view of hundreds of vines turning from bronze to gold. As well as all the usual mod cons, the bathroom goodies are all grape-based Caudalie products, linked to Alice’s original Caudalie Vinothérapie Spa, where I enjoyed an hour-long signature Crushed Cabernet Scrub. A mixture of ground grape seeds, brown sugar, honey, grapeseed oil plus lemon and lemongrass essential oils are massaged all over the body, then showered off to reveal the skin of an infant, followed by a 20-minute massage of your choice. 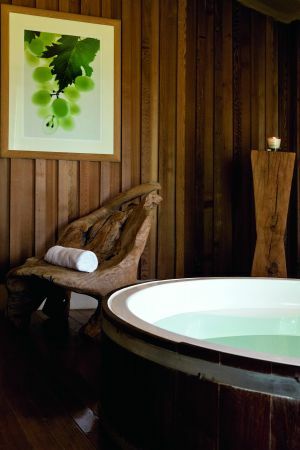 The spa also has a hammam, indoor and outdoor pools, hot tubs and a relaxation room that, like most rooms in the hotel, overlooks the vineyards. 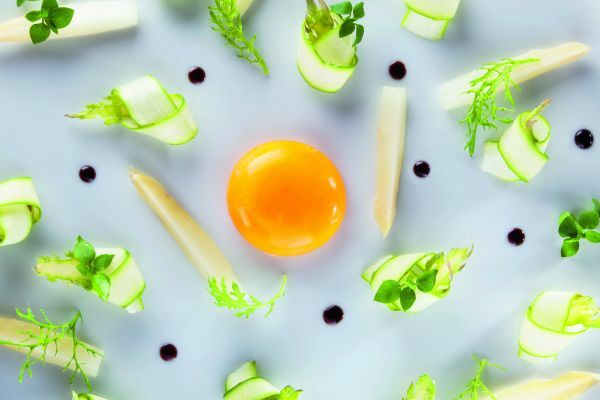 Unassuming, quietly spoken chef Nicolas Masse runs the hotel’s two restaurants: bistro-style Le Table du Lavoir and Michelin-starred La Grand’Vigne. The first is a former 19th century washhouse, once used by winegrowers’ wives, with 18th century beams salvaged from the cellars at Château Lafite-Rothschild; along with antique tablecloths and mismatched cutlery, a convivial air and superb food. For more formal dining, La Grand’Vigne offers dishes such as beef carpaccio and caviar with quail’s eggs to start, roasted fillet of sea bass with squid ink spaghetti, or wild turbot with teriyaki sauce and onions tempura (Nicolas had just returned from Japan), followed by marinated pineapple carpaccio and passion fruit sherbet in meringue. There are also an impressive 54 cheeses to try, plus another 30 maturing in the cellar along with 2,000 bottles of wine. Speaking of which, Alice’s charming parents Florence and Daniel make many of the fine wines available at the restaurants, including the Château Smith Haut Lafette Grand Cru Classé 2009, awarded 100 points by the American critic Robert Parker. This fabulous wine, which now sells for €246 a bottle, has incredible caudalie, the flavour that remains in the mouth after drinking great wine and after which the hotel and spa are named. 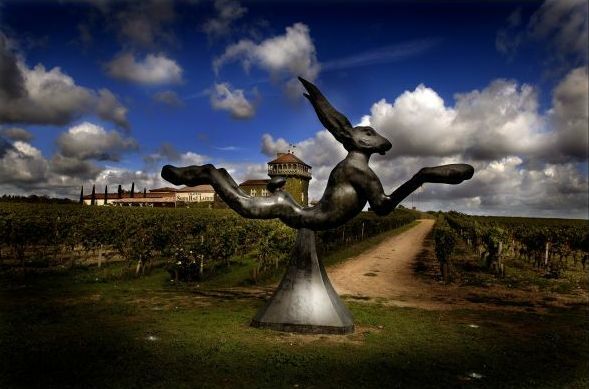 Every time the Cathiards have a good vintage they commission a sculpture, including the leaping hare near the hotel entrance and a large bronze of screwed-up critics’ notes, installed just before they were awarded top marks by Parker. Another artwork can be seen by descending the stairs that magically appear through James Bond-style trapdoors in the tasting room to reveal a cellar containing a vast collection of wine, some dating from 1878, and an infinite well, made using mirrors to give the impression of being bottomless. A sort of rabbit hole made up of looking glasses, you might say. As mentioned earlier, Bordeaux is 20 minutes away and the smaller, medieval village of St Emilion, so famous for its wines, is about 40 by car. Both have UNESCO World Heritage status, awarded in 2007 and 1999 respectively. Particularly worth a visit in one of Bordeaux’s elegant 18th-century limestone streets is La Tupina, opened in 1963 by Jean-Pierre Xiradakis, who was then 23 and still runs the restaurant today. Tupina has a smaller café, Au Comesible, directly opposite (food is carried across the street to the café), where we ate, appropriately enough, under a framed print of a large red rabbit. As well as soup in the tupina (cauldron) available throughout winter, pears poached in red Bordeaux wine are always on the menu. Otherwise, the seasonal menu changes according to what’s available and good in the local markets. We tucked into dishes including the last ceps of the season and beetroot with chopped eggs and capers to start, followed by a selection of meats – beef, chicken and lamb all slow-cooked in the restaurant’s chimney until it falls from the bone; codfish and potatoes – with haricot blancs (white beans) served in their pan, and frites cooked in goose fat. The puddings were all superb, including chocolate gateau, prunes soaked in Armagnac, crème anglaise and canelés, originally made by nuns to feed the poor using rum, egg yolks and imperfect vanilla in the 18th century, when Bordeaux was the biggest port in Europe. Fine local wines accompanied our food, of course. After a long, leisurely lunch, you’ll probably want to head back, perhaps to sip a wine that really is one of the world’s best and whose caudalie, as well as lingering long in the mouth will also remain in the memory, along with the hotel’s restfulness and quirky, arty touches.